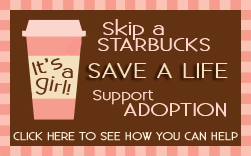 Skip a Starbucks Day Adoption Fundraiser + Giveaways Galore! As you’ve probably guessed by now, I’m a huge advocate of helping out wherever I can. And I’m honored to say that I’m able to do just that by supporting my good writing friend, C.J. Redwine, and her awesome decision to adopt another beautiful baby girl named Isabella Grace (there are no words for how much I adore this name.) by helping with her fundraiser/giveaway to raise the funds necessary to bring Isabella home from China. In November of 2010, my husband Clint and I were in China finalizing the adoption of our first daughter and preparing to bring her home. During the two and a half weeks that we were in China, we both came to the realization that we had to go back. We knew there was one more little girl waiting somewhere in China who belonged in our family. We also knew that this time around, we wanted to adopt a child with some medical needs. We turned in our dossier to China in the beginning of February 2014, and we figured, based on the average wait time for special needs families, that we had about an 8 month wait to get our referral. (A child’s picture and file matched to a family.) But there are two ways to be matched to a child through the special needs program. One is to wait for China to get to your file, translate it, and then search for a child who matches your medical checklist (the list of things we’ve said we’d accept). The other is to be matched to one of the Special Focus kids whose files are sent to our agency each month. Special Focus children are those who are considered hard to place with a family. They have multiple medical conditions, and many families sign on for only one need. Clint and I early on felt that we needed to be open to multiple needs. I kept seeing us with a girl who had a cleft palate and a heart murmur. Clint kept seeing us with a girl who had minor hearing loss and a missing or extra limb. Two weeks after our dossier arrived in China, our agency called us with a Special Focus child to consider. Her file arrived to us on her second birthday. She had cleft palate, congenital heart disease, minor hearing issues, and an extra thumb. To read the rest of the story and see how adorable Isabella is check out C.J.’s post. Needless to say she’s needs our help to bring Isabella home and that’s where SKIP A STARBUCKS DAY comes in. An awesome group of C.J.’s friends have banded together to ask our readers to skip whatever daily (or weekly) luxuries we enjoy (like my beloved KitKats) and donate the money you would have spent and instead help C.J. bring her newest little girl home. In return, you’ll be entered into contests to win many fabulous donated prizes! C.J. is hosting a HUGE giveaway, so pop on over to her blog to read all about it (and of course the rest of their amazing story). It starts today and continues through the weekend until Monday morning at 9am CST. Starbucks giftcard, so you can have your cake (coffee) and eat (drink) it too. 😉 (to five generous people) Open Internationally. A signed set of the first 2 installments of The Elysium Chronicles (RENEGADE; REVELATIONS) + the novella A DARK GRAVE (to three wonderful people) US/Canada only-unless you’re okay with e-copies. A Bath and Body Works gift set (to one fab. person) US only. Visit C.J.’s blog and donate money to help bring Isabella home. You can either leave your entry number in the comments here on this blog, or you can EMAIL your number of entries to me at: j.souders AT jasouders DOT com. ***Entries will be verified with C.J. Redwine’s donation receipts, so please be honest! « Valentine’s Day Spreading the love charity giveaway! I would change the amount of people suffering from depression!!! !